Atchara, atsara, achara or however you spelled it. 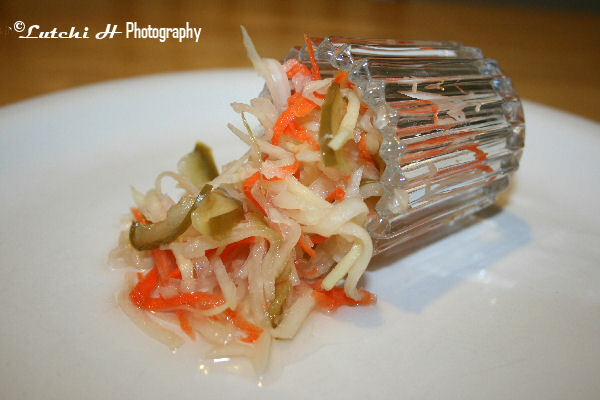 It is a Filipino side dish made from pickled papaya. It’s a perfect condiment to grilled meats and fishes. I have made this atsara over six months ago and opened the last jar two days ago. My in-laws have enjoyed the jar of atsara I sent to them and they can’t wait for more. I did a little researched of atsara recipes and found so many versions but my favorite is the recipe below. It reminds me of my favorite manokan restaurant back in Cagayan De Oro City, Philippines. I love the sweet and sour taste of pickled vegetables. This relish is perfect additions to your condiments. 1. Wash papaya, peel, scoop seeds out, and grate. 2. Squeeze the juice out of it. If you have cheesecloth the better but if not then use your strong hands. 3. In medium sauce pan, mix the vinegar, sugar, and salt. 4. Stir to dissolve the sugar and bring mixture to a boil. 5. Add grated papaya, lower the heat to low and simmer for about 5 minutes. 6. Add the rest of the ingredients. Turn off the heat, cover and allow to cool. 7. If you want to can your atsara for a long shelf life then you may, but I was too lazy to do it so I just bottled it up, sealed and refrigerated. great photo! :) wow. i love atchara. i enjoy it with bbqs! Oh, I love your new home! Love the food! I love atchara...kahit wala ng ulam, yan lang ang kakainin ko..enjoy na ako. Thanks for the visit Luch. Great shots..and the shrimp..hmmm love it..